Fight past the niggles and you'll find a truly epic grand strategy game with a tremendous sense of spectacle. Go, see, conquer. The Roman senate will weep for Crassipes. They'll talk proudly of how the great general threw himself against the walls of Massalia. They'll talk of how he burned the gates and took the central square, and how a dozen Averni javelins ended his illustrious command of Legio I Italica there. But will they talk of the fleet barely a mile away that sat still and watched the great man lemming his way into the history books? Do they realise that the patriot they adored was sent intentionally to his death? I wonder what that would do if they knew that the fate of Crassipes and all the armies and settlements of Rome were not beholden to the gods, but to one bearded games journalist moving them like pawns on a vast playing board. What a beautiful board it is - an intricate papier mache caricature of Europe, decorated with landmarks, rivers and exaggerated topography. Total War has come a long way from the papery maps of Shogun, but its form is the same. You must guide your chosen nation to glory by managing cities, conducting diplomacy, plotting espionage and moving armies to conquer new settlements. When your armies meet resistance, you dive into a real-time battle and command the troops personally. In contrast with the focused, shorter campaigns of Napoleon and Shogun 2, Rome 2 hauls Total War back onto the global stage for a huge and varied campaign. It's 272 BC, and nine playable nations and dozens of others, from Britannia to the northern tip of Africa, to Syria and the eastern tribes are elbowing for space. Rome sets its wardogs against Celtic berserkers in the west, Greece flexes its cultural muscle to gain support in the central territories. In the east, Egypt enslaves nations with its chariots and raging war elephants. This is grand strategy at its most ambitious, not least because Rome 2 is committed to giving the pawns you're sacrificing faces, voices and personalities of their own. That's why I felt a twinge of guilt about poor Crassipes. 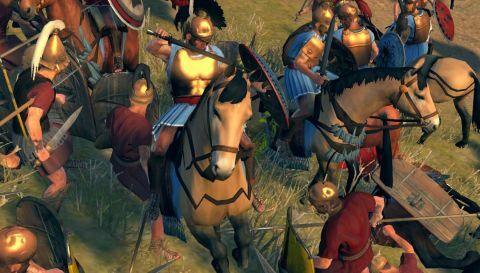 Generals are vital resources in Rome 2. Previously, you could raise tiny armies of a couple of troops and a leader would be picked from their ranks. Now troops cannot move at all unless they have a general, and the number of generals you can have is limited by the size of your empire. The legions they command are also persistent entities that can gain stat-buffing 'military tradition' affixes over time. It's a significant shift that affects everything from how armies are constructed to how territories operate on the strategic map. Territories are now grouped into 'provinces' which can be boosted by production-boosting edicts if you own them entirely (useful for swift social engineering in the face of food shortage), and your cities' buildings now have province-wide effects. Construct a high-grade military training building in Rome and the troops you unlock can be recruited from anywhere within the Italia region. New units are now recruited by generals in the field, sparing them the long walk from their barracks to the battlefield. These changes are designed to reduce the number of moving parts on the board without diluting Total War's logistical complexity. For the same reason, farms, mines and other supporting buildings now sit within city borders where formerly they were scattered across the campaign map like chickenfeed for tiny enemy warbands to peck at. The army limit and condensed targets encourage grander strategic gestures. Where in Shogun 2 I might spend time using small forces to devastate a region's resources before amassing them again to take the territory, in Rome 2 I'll build a huge army and march it up to the doors of their huge city, and then we'll have a huge fight to decide who gets to keep it. Armies are also more flexible thanks to a variety of stances, which can let them move extremely quickly with 'forced march', create a wooden outpost at their location with 'fortify', or lay an ambush on the strategic map. The map has been designed with these stances in mind, so you can dominate large regions with clever use of choke points. Alliances are now extremely worthwhile as well. Allied and client states (who will sit quietly and pay you a tithe every turn in exchange for their lives) contribute to your settlement count for victory conditions, and you can poke your pro-active pals in the right direction with a new diplomacy option that lets you target settlements you want taken. These are excellent changes for two reasons. Firstly, the new interface condenses all of your building work into neat boxes that let you see exactly what needs upgrading where, making building management far faster and easier that previous Total Wars. Secondly, the battles I've had in Rome 2 have been bigger and more dramatic than any I've fought in a previous Total War game - in any game, ever, in fact. When two army avatars meet, they square off on the map and you're given a choice to auto-resolve the battle, fight, or flee. If there's another army within reinforcement range, they'll join in. This is how I took forty units of Rome's finest into a contest with joint Averni and Helvetii forces at the Gallic fort of Bibracte in 190 BC. Thousands died in the drizzle. The Celts charged my lines shirtless, facing my Velites' flaming javelins with remarkable zest, faltering only when they encountered my veteran legionaries. Romans, as they were in life, are a bit OP. Rome 2's battles are stunning. Great attention has been lavished on making troops more responsive. If a unit is under fire they'll lift up their shields, and the incoming projectiles will turn them into wooden porcupines. They'll erupt into rowdy celebration when they rout a unit, and you'll see the exhaustion of the fleeing enemies in their gait. A cinematic battle-cam puts you right into the melee, where you'll hear men yelling to each other and see differences in the way units fight. Praetorians use their huge shields to haul barbarians over and behind them to be stabbed by supporting ranks. Attack dogs, released from their handlers, tear into a fight with terrifying speed and drag down opponents with a flying bite to the arm. If you encounter an exotic unit you like, you might be able to recruit them as mercenaries for a high ongoing cost. Mercenaries are the only troops you can hire in enemy territory, but Romans can construct auxiliary barracks that will let you recruit other factions' units properly. This reflects how the Roman army historically used foreign troops and encouraging a sort of military tourism. I'm still on a quest to unite elephants and Celtic skirmishers in the same army. Battlefields are better, too. They vary hugely depending on weather conditions and location, and are enhanced by the new line of sight system. If your troops can't see an enemy, nor can you, which means every undulation can hide an enemy unit if you don't scout a little. The resulting guessing game keeps the marching portion of the fight interesting and makes fights feel faster. The new engine also allows for proper cities. Major capitals like Rome and Carthage have their own spectacular custom-made maps, and there are variations in the wider world for land and coastal towns, which also vary completely in style and structure depending on their cultural origin. Celtic hill-forts are tiered, earthy formations contained by wooden walls. Romans prefer sheets of white stone and traditional tower fortifications. One settlement in each province will be fortified with walls and require a siege to break, which you can do with equipment like ladders and tortoises built at the siege location. In remembering the battles, and the most marvellous moments of the fifty plus hours I've played so far, it can be easy to forget Rome 2's frustrating elements, which is where the boats come in. Naval warfare is entertaining. Where once it was sluggish and imprecise, it is now merely imprecise, but in a comical close-range fashion. They've been designed to play more like land battles, and they do thanks to assault ships that must ram enemies to death or board them to defeat them in melee. There are also support ships, which instead must float very close to enemy boats to throw javelins at them. Sea battles tend to result in massive wooden boat-mobs and a lot of shouting. However, chances are you'll rarely fight at sea. The AI does transport armies across the ocean, and does so effectively, but it never seems to raid trade routes or build especially large fleets. I've often encountered towns surrounded by four or five tiny one or two-boat navies doing nothing. There are also problems with coastal defence fights. For the first time in the series, land and sea battles can take place on the same map. Boats that survive the sea battle can run ashore and deploy troops directly into the land fight in scenes that would be extraordinary if the troops didn't sometimes fail to disembark, or simply stand still on the beach unmoving forever. I've had three major coastal siege battles in which I've had to sit back, fast-forward the battle and let the 60 minute timer tick down to gain an automatic siege-defence victory against a frozen AI opponent. The severity of the problem seems to vary greatly depending on the map you're fighting on. Disappointing, yes, but three incidents in 50 hours is far from game-breaking. Worse is the AI's tendency to constantly suicidally throw tiny forces against cities. This tends to happen when you defeat a faction, and all their homeless mini-armies are left wandering the map mindlessly attacking things. All the busywork that's been saved by moving resources into cities is undone by this relentless phenomenon, which grows worse the bigger your empire gets. Towards the end I was auto-resolving four or five useless assaults per turn, and because auto-resolve often doesn't kill tiny units outright, they keep coming back. Along with the extremely long end-turn loading times (which lasted more than two minutes each on my half-decent home PC), this slows down progress enormously. This is only part of why Rome 2 feels glacial even compared to Empire. You won't complete a campaign on a Sunday afternoon, or over a weekend. Expanding across such a huge map takes time, and the balance between keeping public order in just-conquered territory and starting new invasions is a constant concern that stopped me from running slipshod over the map. Managing the correct balance of buildings sometimes felt more like admin work than empire building when juggling multiple territories, though I did find that I had more money than I could spend once I'd amassed enough settlements. That's useful for greasing the palms of would-be allies. Sadly, the promising but opaque domestic politics system falters as well. Before you take charge of a republic you must affiliate with a domestic party. Of the three available Roman options, I took charge of the House of Julia. Every general you install belongs to one of Rome's houses, and their might, reflected in two stats – gravitas and ambition - contributes to their house's influence over the senate. For monarchies or tribal societies the setup is reversed – your house starts with huge influence and the other houses will attack when they think you're growing weak. This created a fascinating tension, initially. I was watching my generals with suspicion, and promoting and offing contenders accordingly, plotting like a true Roman. That's why I sent Crassipes to Massalia to die. His many victories earned him Batman levels of gravitas and I'd started to worry about his aspirations. I needn't have. Your house's influence is measured in senate support, and mine crept up throughout the game at a steady pace by itself. At an apparently random point (83% support, for me) civil war broke out, and the leading generals of the other houses took their armies, took a settlement and marched for Rome. The civil war was an interesting challenge and after I'd crushed all senate sympathisers I could choose whether to remain a republic or go full-despot as an empire, but the domestic politics that triggered it doesn't seem to require player input. I tried to speed up Rome's turn from republic to empire by taking action against the other houses, but assassinating their members reduced my senate influence, seemingly staving off the transition. After many, many turns, the way ambition, gravitas and influence interact remains unclear. Fortunately, you can ignore the system and carry on regardless, which means you're free to enjoy a rather good Total War game. I should mention though that you'll need a good PC to run it properly. Mine is well above the published minimum specs, and the campaign map was running at around 20 FPS on low settings. Conversely, my high-powered office machine ran it faultlessly, and it was a faster and more enjoyable experience as a result. There are a few other considerations that can't be factored into the score that are still worth mentioning - we can only review what a game is, not what it could be, after all. It would be blinkered to ignore the power of the Total War community, who have been producing spectacular mods for the series since Rome 1. If you use mods, then Rome 2 doubles as a platform for greater things, and you'll likely get a lot more bang for your denarii in the coming years as a result. Creative Assembly's pro-active history with patches may well fix some of the problems mentioned as well, and we'll address those in future articles should that happen. Right now, Rome 2 has its flaws, but is still a sumptuous, slow-burn strategy game with some of the best land battles in the series. Aesthetically, it's a triumph. Empire management, alliances, the UI and battlefields have all improved, which makes it doubly frustrating to encounter the floppy AI that will be extremely familiar to Total War fans by now. Still, nothing out there does what Total War does with this degree of scope and detail. I'd still recommend it to armchair generals anywhere.